While you can certainly buy a bunch of expensive equipment and enjoy virtual reality in the comfort of your own home, the real promise of the technology has always been an experience that allows you to physically move around a virtual world. Local startup MassVR has developed a VR gaming platform that allows up to eight players to face off against each other in an arena a bit larger than a regulation basketball court that tracks their position and movements (and prevents players from running into each other). 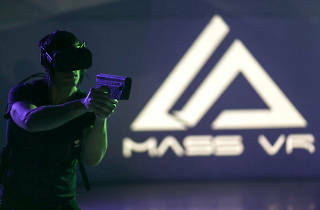 MassVR will open its 6,000-square-foot VR gaming facility in Schiller Park (5135 Pearl Street), just south of Rosemont, on February 2. Gamers will be able to book time to play four-on-four matches of VR Champions—a first-person shooter simulation that appears to be inspired by video games like Halo and Call of Duty. The game tracks players' movements in the real world, allowing them to run, jump and ride zip lines through a virtual environment while shooting at their opponents. 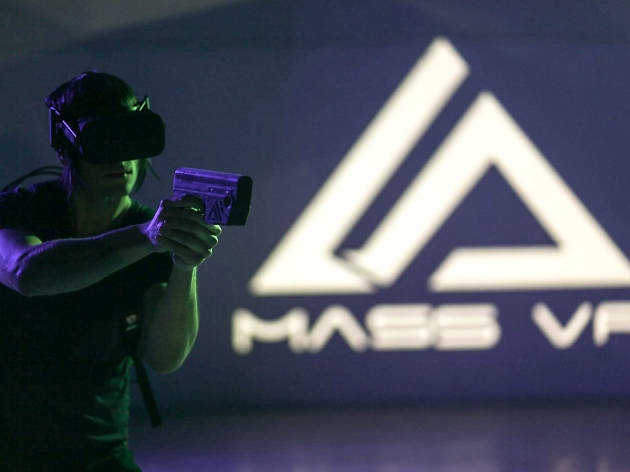 A single session at MassVR is $40—a bit pricey, but comparable to the cost of admission at a similar Star Wars-themed VR attraction that recently opened outside of Disneyland. Take a look at some footage of the VR Champions game as well as some video of players running around MassVR's physical arena.